Over 15 years ago, I spent a couple of months in Nepal. I stayed at the house of a zen monk I had earlier befriended in Japan. 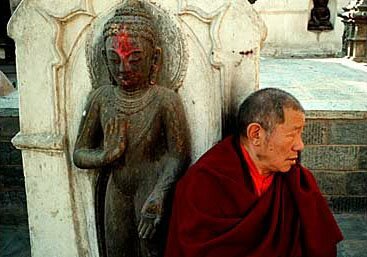 He had purchased a small house in Kathmandu for travelers, especially other Japanese. I was an exception to the Japanese rule, but was welcomed wholeheartedly. Cost was about five dollars worth of rupees per week placed in a communal coffee can for rent and groceries. We cooked meals nightly on the flat rooftop deck as a little community of travelers. I was a wayward youth. Another was a young Japanese who had tired of his and his culture's growing materialism and was seeking some kind of redemption by hanging out daily with Nepalese street kids, learning what he could of the language, and trying to understand the country through the minds of children. A couple other visitors had been climbing in Pakistan and had traveled over land to Kathmandu, mostly by foot. Yet another was an anthropologist who was planning to head off in the direction of Everest where there were some promising villages for studying textiles. The nights were filled with a dark Meno geometry from underneath the mosquito net, the mosquitoes so dense that you estimated by sound how many there were in each square foot of the dark room. Then when the last human sounds of the city had died, the dogs would begin. One bark maybe a kilometer away, then another from another area much closer, then yet another to the east, two to the west, until the city was filled with the sounds of dogs barking, gossiping, telling jokes, having patiently slept the day away or scrounged the streets for food in preparation for the nightly conversation. I had no particular plans when I arrived in Nepal other than to see Kathmandu and then to go walking into the Himalayas. I was going to follow along with the anthropologist thinking that this would be a particularly nice way of exploring some of the country. As it turned out, I ran into a friend from the US by sheer accident. Last he had heard of me, I was still living in Japan. Last I had heard of him - via another friend's letters picked up at the American Express office in Bangkok - he was possibly going on a scientific research mission to Australia. Those were the days of those wonderfully rare letters written by friends who had no idea whether you would ever receive them. No internet cafes yet, which now populate even the most remote places. They were the days when "Lonely Planet" signified a sentiment all longer-term travelers understood. Lonely Planet, the guide, had started as what was called simply "the yellow book," perhaps the most famous guide to Southeast Asia, passed from one traveler to another. That intimacy with strangeness and delicious loneliness changed quickly over the 1990s. But the friend, J.... I went to pick up the required trekking permit at a small dusty brick building in Kathmandu. A Euro-American exited as I approached. You say "hello" to other Euro-Americans. A fellow colonialist. Foreigners were rare in this part of the city, mostly confining themselves to the hipster area, Thamel. This particular fellow's white face slowly materialized into recognizability, then astonishment, then further recognizability. My friend, J. Later we realized that we could have been in Kathmandu at the same time and never run into each other. Has this happened to you? In an Irish pub in Paris I once bumped into an acquaintance met on a double-date in Japan - the girls had danced all night while we sat at the bar and drank a bottle of whiskey and talked philosophy, politics, and basketball. I talked with him in the Irish pub for about half an hour before I realized who he was - we both had new beards. I've run into a friend in the airport in Hong Kong as we both raced in opposite directions to catch our flights. I've crossed paths with an Italian friend in London who I knew only from Italy. Has this happened to you? Startling odds, after all, that make you wonder how many times you've simply come close but missed. The friend in Nepal and I decided to trek together and I backed out of the trip with the Japanese anthropologist. We both had a few weeks of time to hike and decided instead to go west to the Annapurnas rather than east towards Everest. We took a bus to Pokhara. I remember the bus ride as about eight hours long and a constant precarious teetering over the edges of precipices. The trip is probably shorter, but memory is like that. 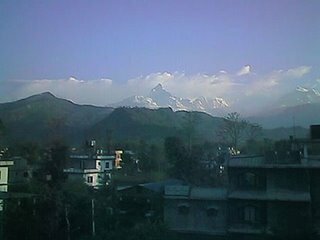 We stayed a day or two in Pokhara, then set off on foot. You can see the magical Machapuchare - The Fishtail - in the distance from Pokhara. It's a sacred peak; no climbing allowed. But we hadn't seen any of the other mountains (except for Everest above the clouds from the plane). 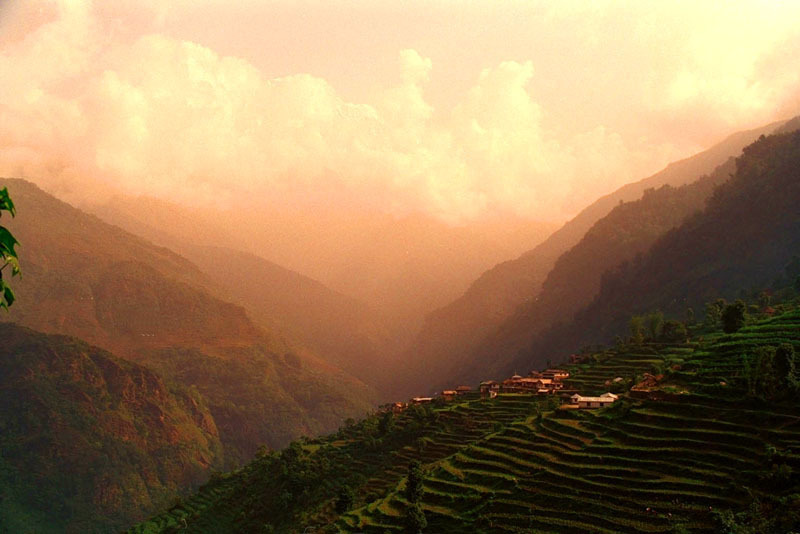 Only those mountains they call "foothills" in the Himalaya. The goal, let me get to the goal. 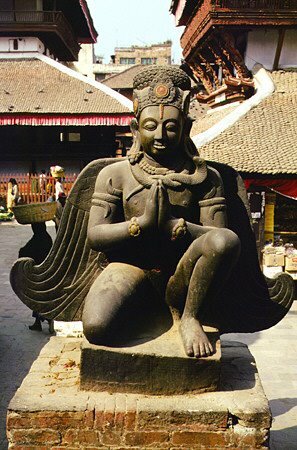 The goal was the holy temple of Muktinath, one of the holiest in Hinduism. It is said that Brahma had visited the tiny village and had lit three fires: one on stone, one in the air, and one on water. The temple housed the flames. I liked the story, but doubted its truth. We arrived in Muktinath after about ten days of hiking. 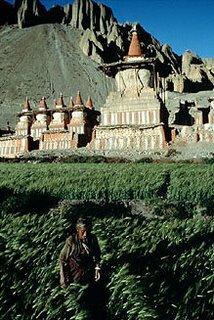 The village rests on barren landscape at about 14,000 feet with the air filled with prayer flags. The sound is haunting - prayer flags that catch the wind and let loose their prayers into the ether. 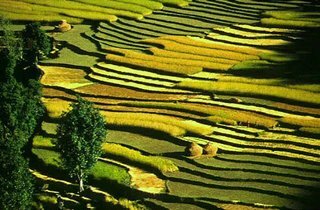 Across the valley and about a thousand meters down are green patches of rice fields. The temple is another altitudinous walk up the mountainside. Ten steps and you have to take a break for oxygen. It doesn't help to smoke cigarettes, although a Ghurka man with us had no problem, of course, and he smoked more than I. 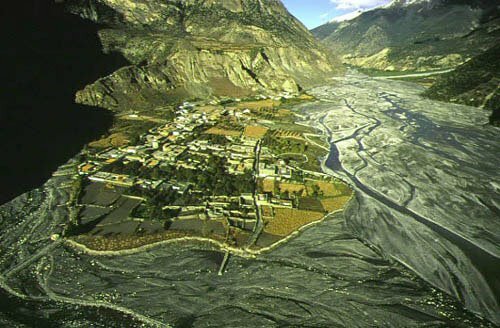 The temple is nestled near a mountain pass with a view that presides over the Kali Gandaki Valley. Mustang and Tibet are to the northeast. 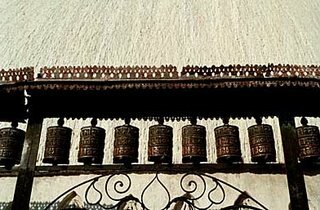 Prayer wheels, as at most Nepalese temples, encircled the temple of Muktinath. The Ghurka friend ran with joy around the temple spinning all the wheels. Everything that lives, dies - the wheels spin and come to a slow stop. Two old women crouching near the front door in dark burgundy Lama robes motioned to us. One of them revealed a large old key from underneath her robe. The key to the temple. She opened the door and nudged us inside. After the brightness of the sun on the snowy peaks, your eyes take a moment to adjust to darkness. The interior had a musty tranquility that slowly focused into a beautiful chamber of thankas, the Tibetan painted scrolls. One of the women gave us two oil candles to light and set afloat on a small pool. The other pressed red and orange tikas onto our foreheads. Would you like to see the flames, our Ghurka friend asked. I could hear a trickle of water coming from a shrine at the far side of the temple. There were three short curtains side by side. One of the women lifted one of the curtains. 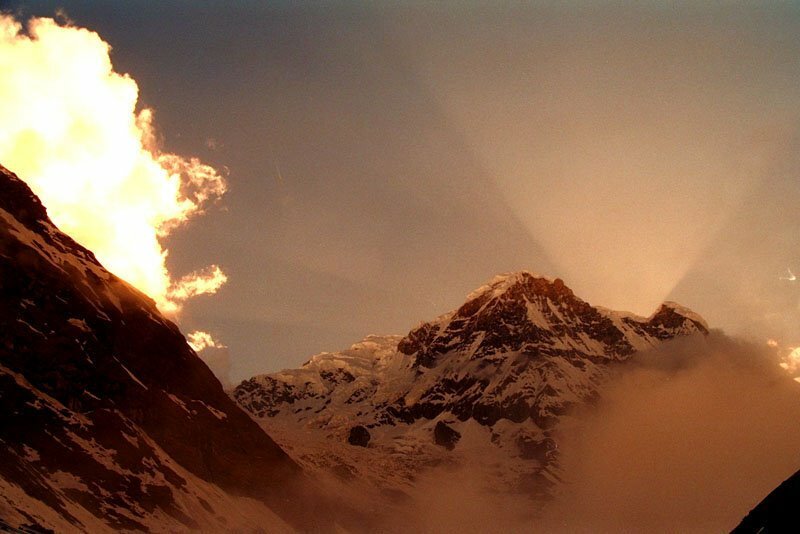 There was exposed rock, the side of the mountain, with a small flame bursting from it. The next curtain was raised. A trickle of water ran from the rock out of which another flame sprang. The third, we were told, the flame in air, had gone out many years ago. Both J and I resisted explaining the flames to each other. Our native urge was to turn to explanations of natural gas seeping from the rock and so on. But why ruin the experience? We had been in Nepal long enough to simply allow the experience to be what it is and to revel in the joy of the moment, like running around the temple spinning prayer wheels that signify that all that lives dies. Our cameras didn't ruin the sanctity either; both of us found that we were out of film. On the return down the mountain to the village, we came across a stream we had mostly ignored on the way up. The stream was lined with poplars said to have grown from the staffs left by early pilgrims on their way to Lhasa. The stream of water, it appeared, ran uphill. J and I were perplexed. J is a geophysicist. He explained that it would be possible for the flow from the mountain to push the water uphill over short distances. I countered that the stream in such a case would widen due also to gravitational pull. Yet, it remained the same width and depth in the places it appeared to move uphill. I thought it was a matter of perception. We had hiked through dramatically changing diagonal elevations so that the horizontal was no longer a baseline of perception. We were lightheaded from the altitude. We had just experienced the flames of Brahma. Water can move uphill, it turns out, through a phenomenon called The Leidenfrost Effect. Thanks to Pruned for setting me off again on this little voyage. Great photos BTW. I was very into photography myself while I was there. Had a little Minox I picked up in Malaysia. I shouldmention that the photos aren't mine. They were on my hard drive, downloaded long ago, and I no longer have the attribution. I'm hoping I'm not sued. My photos were better, actually, I think, but they're all prints and quickly deteriorating negatives. Great travelogue, helmut! 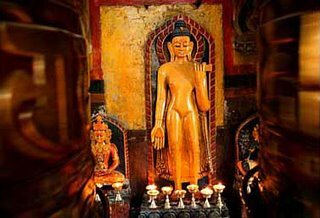 Nepal tops my list, w/ Cambodia a close second, of places I must visit as soon as possible. Thanks for these wonderful memories. I've had a couple of serendipitous run-ins: a former teammate of mine outside of Carnegie Deli, a guy who'd been in my Psych class in the train depot in Amsterdam, and one of my favorite professors in London. I never meet people I know when I'm traveling. Never. I suspect the odds of this are much higher than meeting people. If you have something like ten people in a room (I forget the actual number, but it's like this), there's a high probability that two of them will have the same birthday. The odds of not meeting people are probably lower than meeting someone you know. Sorry. I should use the preview function. ps: you can photograph your prints with you digital camera. for web use it will be ok. REspect and admiration just grows. While I and everyone I knew were subsistence farming and thumbing Snow Leopard some were DOING the dreams. Thanks for this. Thanks for the nice words, folks. And go there some day, if you haven't already! "Been there, done that." I was introduced to that phrase during the 80's in SE Asia. Everyone from down under made that comment, some in jest. oops. The above comment is from mt. Been here and done that comment!